Founded in 1910 and touching on four distinct Brooklyn neighborhoods, this world-class botanic garden covers 52 acres (21ha). Within its provenance are stunning specialty gardens and conservatories that welcome almost one million visitors a year. “Gardens within the Garden,” specific plant collections, and the Steinhardt Conservatory, housing the C.V. Starr Bonsai Museum are favorites. Then, the 3-climate-themed plant pavilions, a white cast-iron and glass aquatic plant house, and an art gallery bring the world of botany to the joy of everyone. Seasonal displays are awesome. With over 200 cherry trees (42 species/varieties) this is one of the foremost cherry-viewing sites in the world. The Hanami festival and its Sakura Matsuri weekend lure participants from the world over. The entire Japanese garden is splendid. But, no plant species are absent in the many specialty gardens and greenhouses, and seasonal festivities center around each perfect bloom period. 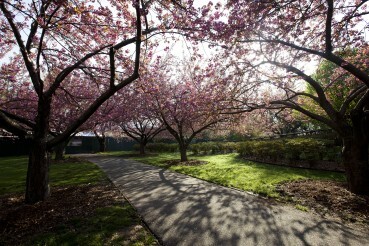 Just minutes away; make The Condor Hotel near The Brooklyn Botanic Gardens, your choice in Brooklyn Hotels.